There's nothing quite like getting out into the countryside with your four-legged friend and exploring new routes together. It might all seem like fun and games, but hacking can really benefit your horse too. Not convinced? Check out these reasons to get out of the school and onto the bridleway. Hacking provides variety in your horse’s work, which is vital for keeping him interested in life and keeping him on your side. Hacking out and moving around is perfect for keeping any stiffness or filled legs at bay, especially if your horse is in his twilight years. Getting your horse out and about regularly, seeing, passing and coping with new unusual things, is one of the best ways to make him brave – he’ll be a much nicer ride than a spooky horse who lacks confidence. Racking up the miles is good for your horse’s fitness levels, keeping health issues related to obesity and lack of fitness, such as laminitis and equine metabolic syndrome, under control. Finally, a hacking horse is a happy horse! Surely the goal of every horse owner? Don’t miss the latest issue of Your Horse magazine where we share the simple ways to up the ante and boost your hacking mojo this month. 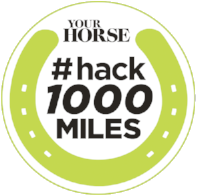 We’re passionate about hacking at Your Horse, so much so that we’ve launched a campaign to challenge you and your horse to hack 1000 miles in a year! If this sounds like your cup of tea, why not find out more and sign up at our exclusive #Hack1000miles website. We’ve also got a fun and friendly Facebook group, full of keen hackers just like you. Pop by and say hello!